Today marks the beginning of an exciting new chapter at Omise. We’re thrilled to announce that we have secured USD$ 17.5M in our Series B round of investment. This marks one of the biggest investments injected into a Fintech in Southeast Asia to date. The round was led by SBI investment, with participation from undisclosed partners. Some of our returning backers include Sinar Mas Digital Ventures (SMDV), Ascend Money and Golden Gate Ventures. We’ve raised more than USD$ 25M since our June 2013 establishment. Our goal is to be the leading online payments provider in the Asia Pacific region and beyond. Much of the financing will be going towards product development and to assist us in expanding further into Southeast Asia. And just a heads up for all of you, we’ll be up and running in Singapore by the end of the year. Other than more cash in pocket, we’ve something else that we’d like to share. We just got a makeover. When we started working on our payment gateway, all the time we had went towards building the product and launching new features like crazy. We targeted mainly developers to make sure we were building things the right way and most of our merchant were SMBs. 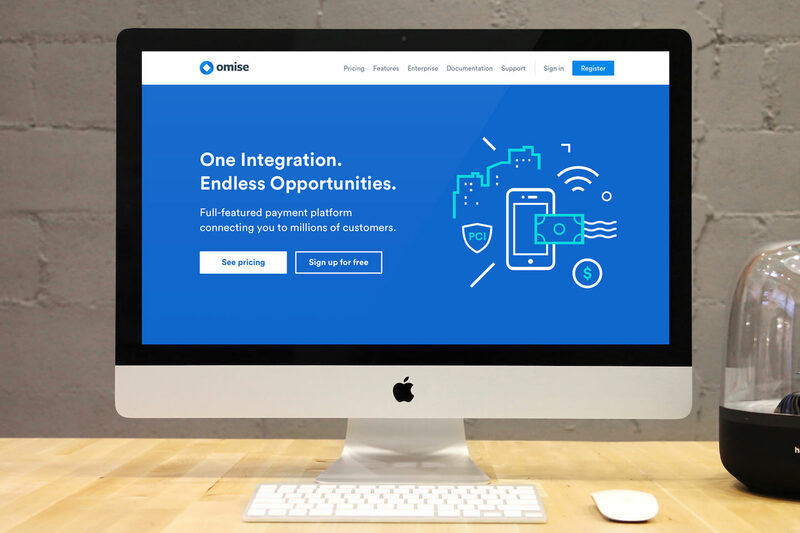 Our previous branding represented Omise as a “Cool”, “Simple”, “Smooth” and “Easy” to use payments provider. Then in January, we added quite a few backend features which boosted the capabilities and scalability of our platform. What we’ve come to realize is that Omise does have the potential to power payments for multinational enterprises. As we grew out of our “young & fresh” phase, we talked a lot on how we could better represent the Omise that we’re about to become. Inspired by the old Asian coin and mobius strip, this new look best celebrates intelligence and sophistication. You’ve probably seen our updated design on Facebook and Twitter. Stay tuned for our new website, coming very soon. We want to build a Baas (Bank as a service), that’s our goal. Since Amazon Web Services (AWS) hit the market, anyone from students to Nasdaq were able to build their own cloud-base environment. Saas (Software as a service) gave mankind a brighter future. What we lack is a digital bank as a service, and that’s the platform we’re building. Omise is here to provide online merchants, just starting up or well-established, to easily enable commerce without the hassle of conventional regulations. One day building your own digital bank on the cloud will be possible. We’re no more online payment service, we’re a payment platform.